2018 was an explosive year for enterprise mobility growth, but it was also a year filled with complexity. And while most organizations juggled their own mobility strategies, only a select few were successful. So what’s ahead for enterprise mobility in 2019? 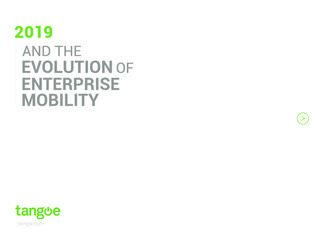 Jump into this white paper to reflect back on the trends, outcomes, and failures of mobility strategies in 2018 – and hopefully learn from those mistakes. Plus, get a glimpse at 2019 forecasts for enterprise mobility as technology like 5G, artificial intelligence, and IoT continues to mature.